When it’s time to elevate your sewing game, you may be on the market for a new machine featuring some of the latest computerized technology. However, if your budget limits the models you can consider, take a look at the Brother CE8100. Featuring 120 built-in stitches, both decorative and utilitarian, you’ll be able to add those final finishing touches to any project. Is the Brother CE8100 Your next Sewing Machine? 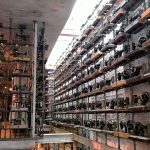 Brother Industries offers over 100 years of experience in the manufacturing of sewing machines. Following new trends in the market and innovated new directions, Brother drives new tech in home sewing with every machine they produce. New developments from Brother include StitchVision and home embroidery and quilting machines that give home sewers professional results. StitchVision allows the user to see a projection of their stitches and embroidery designs on the fabric before committing to a single stitch. New features in Brother machines include enlarged workspaces for embroidering designs. Portability, without losing functionality, has also driven the direction of their recent lineup of machines. The Brother CE8100 is the perfect budget model for the creative sewer. It’s also an excellent choice for sewers new to computerized sewing. The control panel is easy to see and to use, with graphic icons for each stitch to help the user reference and choose the pattern used. Additionally, the straightforward layout of controls on the machine results in a sewing machine you can use intuitively without referencing the manual. If you’ve been planning to add to your repertoire of sewing skills with finishes and decorative elements, the Brother CE8100 provides a host of optional stitches and specialty feet for ruffles and buttons. You can make your own finishing bindings for embellished hems, seams, and accessories. These options allow you to create exciting new home décor items, as well. The Brother CE8100 lifts basic sewers into artists. 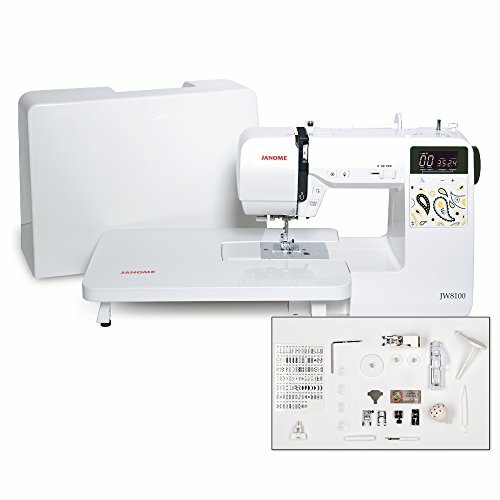 The Brother CE8100 features 120 programmed sewing stitches and 160 stitch functions. You can also choose from eight one-step, auto-size buttonholes for a convenient way to add a professional finish to your closures. The high-end, seven-point feed system means you can utilize a wide range of fabrics, from delicate satins to sturdy denim and canvas. You’ll get evenly tensioned seams without pulling, puckering, or gapping of your material. The Brother CE8100 also features a drop feed dog for quilting and decorative top-stitching. No more laborious hand-sewing for top stitches! For ease of use with large garments and quilts, the CE8100 features an extra wide table so you can maneuver large pieces of cloth under the needle without continually having to stop and readjust your fabric. The wide table detaches to allow you a narrow free arm for cuffs, collars, and sleeves. You’ll also appreciate the super bright LED light that illuminates the table and allows you to work in any lighting conditions. The front panel LCD screen is back-lit for more comfortable viewing in any lighting conditions. It measures 2.0 by 0.7 inches to reduce eye fatigue during long sewing sessions. The Brother CE8100 includes an advanced automatic needle threading system and a jam-resistant drop-in bobbin system. These advances come in handy for new sewers unused to threading sewing machines. They’re also helpful to experienced sewers with aging eyesight or dexterity. In fact, for sewers of any age or experience level, these features save on time and reduce frustration. You can easily adjust your sewing speed to the machine’s maximum stitch speed of 850 stitches per minute using the variable speed control on the machine. The Brother CE8100 features a maximum stitch length of 5mm and width of 7mm. The Brother CE8100 comes with the company’s seven standard sewing machine feet. These include a zipper foot, buttonhole foot, button sewing foot, blind stitch, zig-zag, overcast, and a monogram foot. It also includes the company’s “Special Home Dec Foot Pack,” which consists of a cording foot, gathering foot, and binding foot. The gathering foot allows you to gather fabric and attach it to your project for ruffles or a pleated effect. The binding foot lets you create decorative edging for your project with a professional finish. The machine also comes with a variety of needles, spare bobbins and spool caps, and a seam ripper. For maintaining your machine, you’ll receive a cleaning brush and screwdriver. Dimensions: 12.5 inches wide by 7 inches deep by 16.3 inches high. Brother distributes this model through Walmart stores, as well as selling it online on Amazon. You’ll find the Brother CE8100 priced between $162 to $220, depending on the retailer. The Brother website also has a handy feature that allows you to click on “where to buy” on the product page and find your nearest local retailer. Another excellent resource from Brother Industries is an easy to find support page where you can download user manuals and a quick reference guide. You can also download information on how to use some of the machine’s unique features. Although its distribution seems to be limited to the budget market, users seem to really appreciate its high-end features. Buyers at both Amazon and Walmart rate the Brother C8100 at 4.4 and 4.5 out of 5 stars, respectively. Because of this limited distribution, the machine only shows about 100 or so reviews. However, the overwhelming sentiment is that it’s an excellent little machine for a reasonable price. But how does it compare to other machines? You’ll find that the Janome JW8100 provides many of the same features as the Brother CE8100. This sewing machine comes with fewer computerized stitch settings – only 100 compared to the 120 on the CE8100. 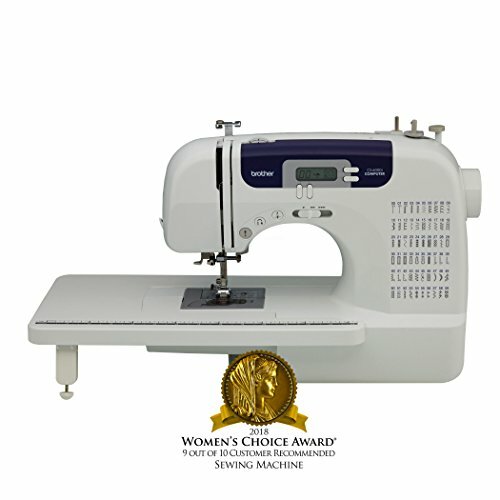 However, like the Brother model, it features adjustable speed and an extra wide table for monogramming and embroidery. On the upside, the Janome JW8100 sewing machine has a contrasting white on black, back-lit LCD panel, which may be easier on the eyes for some sewers. It also includes a hard plastic dust cover for portability and protection from dust during storage. Additionally, it comes with limited specialty feet. Instead of gathering and cording feet, it includes an even feed foot for quilting and a quarter-inch foot for precise seams. Janome sewing machines boast a one-handed needle threader and drop-in bobbin threading, as well. The Janome machine includes seven automatic buttonhole settings, compared to the eight provided by the Brother CE8100, but both feature a reverse button for locking stitches and reinforcing seams. One advantage of the Brother model is that the Janome doesn’t have a stitch guide printed on the machine. Instead, it has a decorative paisley pattern that adds nothing to the machine either aesthetically or functionally. The machine comes with a separate reference card you need to have in hand to choose the programmed stitches, which is unfortunate should you lose track of it. Depending on the retailer, ​the price varies for the Janome JW8100. We found it at Walmart, Amazon, and Joann Fabrics, with Joann coming in at the highest price. Customer reviews varied from site to site, but overall reviews averaged 4.7 out of 5 stars for a total of 43 reviews. This Singer model is a bit of an upgrade from the Brother CE8100. However, it also features an extra wide table for quilting. 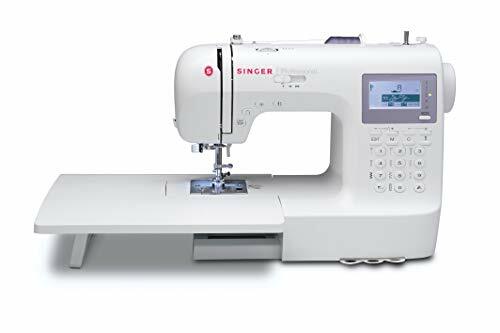 Slightly more expensive than the Brother CE8100 or Janome JW8100, the Singer 9100 features 404 built-in stitches, including two monogramming alphabets. What makes it comparable is its price range and focus. The Singer, like the Janome and Brother machines, provides a low-cost option for topstitching for quilting. Like the Brother model, the Singer 9100 has a built-in needle threader and drop-in bobbin system to reduce frustration. It has an additional one-step automatic buttonhole setting; the Singer offers nine, compared to the Brother model’s eight. It also features nearly triple the number of computerized stitches. You won’t find all these stitches featured on the front of the machine. However, the LCD control panel walks you through the settings with a graphic interface. Additionally, it comes with a broad selection of specialty sewing feet, including those for zippers, blind hems, satin stitches, overcasting, gathering, rolled hems, and more. You’ll also find a darning and embroidery foot included, as well as an embossed edge and quilting guide. There are several disadvantages with the Singer when comparing it to the Brother CE8100. The first one that comes to mind is the overwhelming number of stitch selections. Most home sewers will find themselves stumped at the thought of using that many stitches. The pre-programmed monogram alphabets are a bonus, but how often will you use them? And, if you do plan to do a lot of embroidery, that begs the question as to whether this low-cost model is really enough for your needs. The graphic display seems a bit confusing at first glance, as well, and it may take you some time to get used to it. It doesn’t seem as intuitive as the Brother CE8100. And then there’s the price. Expect to pay between $250 to $330 for the Singer 9100. We found this model sold on Amazon, Walmart, and direct from Singer’s website. Users haven’t been enthusiastic with their feedback, either. Walmart shoppers rated this Singer model 3.8 out of 5 stars. Amazon buyers were more forgiving with 4.2 out of 5 stars. Singer model don't seem to hold, resulting in puckering and gapping on seams. And although many users stated that they like their Singer 9100 machine after purchase, others suffered regular computer glitches when trying to set stitches as well as gross misalignments that made the the automatic threader and drop-in bobbin system useless. Like all computerized equipment, the Brother CE8100 has its own foibles. While the bonus feet are great for creating a wide range of decorative elements, you’ll find the CE8100 has a few peccadilloes as well as outstanding features. 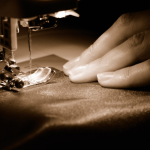 With more pros than cons, the only determining factor is how much sewing machine you need. If you’re a basic or new sewer, you may find it has enough features and extras to add some those final finishing touches to your projects. If you’re an experienced sewer doing complicated finishes, it might not have the features you want. For quilters, the Brother CE8100 is an easy-to-use, portable model that you can take to groups and clubs for co-working. It may not have what you need if you're planning to do extensive machine embroidery. It’s also probably not your best choice if you’re planning to turn garment construction into your next career. However, for most home sewers interested in creating clothing and making home décor, the Brother 8100 has just enough versatility to do everything you need. With the bright LED workspace lighting, back-lit LCD panel, wide table, and automatic threading, it’s especially useful for those with accessibility issues. So, it’s an excellent choice for sewers both young and old. It also fits nicely into most budgets for serious crafters. Next articleCan the Brother CS5055PRW Sewing Machine Sew Up Your Fashion Dreams?